H.E. Rasheed Mohammed Al Maraj, Governor of the Central Bank of Bahrain and Chairman of the Specific Council for Vocational Training (Banking Sector) of the Bahrain Institute of Banking and Finance (BIBF), was recently welcomed to a special alumni reunion in Bahrain by Bangor University’s President, Professor John G. Hughes. Over 170 attended the event on Tuesday evening to celebrate the partnership between Bangor and BIBF. The reunion took place a day after the annual graduation of BIBF, which this year saw over 50 Bahraini students receive their Bangor-validated degrees. The partnership between the British university and BIBF began in 2004 with the first cohort of students graduating in 2007. Since then more than 500 students have graduated with this programme, many of whom have travelled to Bangor to study. Senior members of staff from Bangor included Professor Phil Molyneux, College Dean of the Business School, and Sheila O’Neal, Director of Development. BIBF’s Director, Solveig Nicklos also attended the event. Bangor President Professor John G Hughes presented H.E. 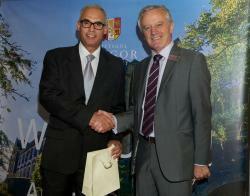 Rasheed Mohammed Al Maraj with a commemorative pen to mark the partnership between Bangor and BIBF. Bangor University is a renowned traditional British university and is among the top 100 universities in the world for its international outlook. Its business Bangor University alumni enjoying the reunionschool is ranked in the top 20 in the world for Banking Research (RePEc, as of January 2015), and the Times and Sunday Times places Bangor in the top 50 universities in the UK. Bangor University was also the first in the UK to offer an MBA in Banking & Finance and has many partnerships with countries in the Gulf, including BIBF and the Emirates Institute of Banking and Financial Studies (EIBFS).